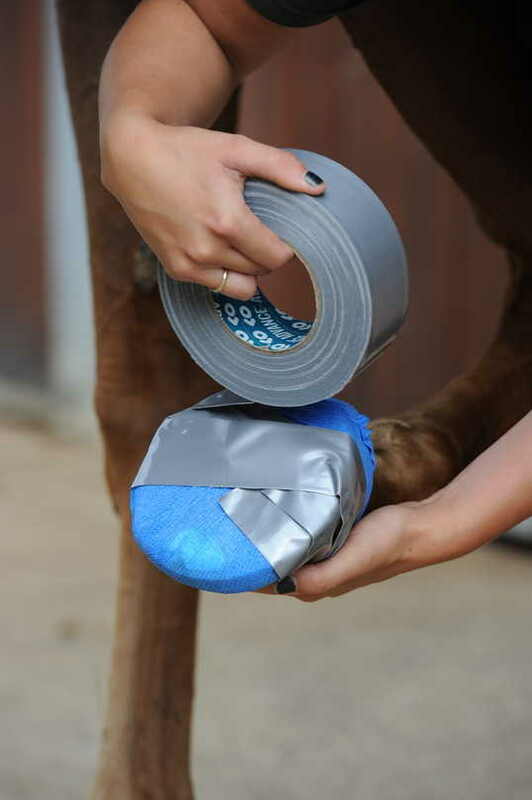 Securing your horse's poultice in place can be tricky. Here, equine vet Gil Riley gives his advice on how to keep a poultice secure. The best way to keep a poultice on is to keep it as minimalist as possible and to restrict the movement of your horse as much as possible. As you can imagine this is difficult, but one way to do this is to keep him on strict box rest for the time he needs a poultice on. More often than not, I’ll use the poultice material alone and secure with some sticky duct tape. An even more effective way to help them stay on when dealing with a foot abscess, is to bathe your horse’s foot (using warm water in a tub) for five minutes. When done, towel dry and then simply apply a dry pad, you can use gamgee for this, and secure with duct tape. I’ve found that using a dry dressing will mean it’s more likely to stay on.